What are the decisions confronting jurisdictions that are considering alternatives to traditional marijuana prohibition? How much marijuana is consumed in Vermont? 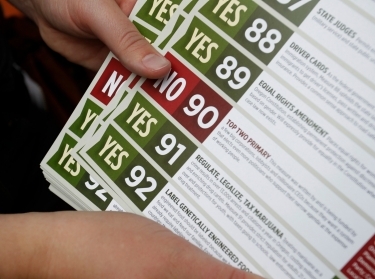 How much does Vermont spend enforcing marijuana prohibition? What does the current scientific literature find about the consequences associated with marijuana consumption? How much money could the State of Vermont earn from legalizing marijuana? How much does it cost to regulate legal marijuana? Marijuana legalization is a controversial and multifaceted issue that is now the subject of serious debate. Since 2012, four U.S. states have passed ballot initiatives to remove prohibition and legalize a for-profit commercial marijuana industry. Voters in Washington, D.C., took the more limited step of passing an initiative to legalize home production and personal possession. In December 2013, Uruguay became the first country to experiment with legalization nationwide. In May 2014, Vermont Governor Peter Shumlin signed a bill into law that required the Secretary of Administration to provide a report about the consequences of legalizing marijuana. This report was produced for the Secretary of Administration in response to that legislation. The report does not make a recommendation about whether Vermont should change its marijuana laws. The goal is to inform, not sway, discussions about the future of marijuana policy in Vermont and other jurisdictions considering alternatives to traditional marijuana prohibition. The principal message of the report is that marijuana policy should not be viewed as a binary choice between prohibition and the for-profit commercial model we see in Colorado and Washington. Legalization encompasses a wide range of possible regimes, distinguished along at least four dimensions: the kinds of organizations that are allowed to provide the drug, the regulations under which those organizations operate, the nature of the products that can be distributed, and price. These choices could have profound consequences for health and social well-being, as well as job creation and government revenue. Marijuana policy should not be viewed as a binary choice between prohibition and the for-profit commercial model we see in Colorado and Washington. Legalization encompasses a wide range of possible regimes, distinguished along at least four dimensions: the kinds of organizations that are allowed to provide the drug, the regulations under which those organizations operate, the nature of the products that can be distributed, and price. Vermonters likely consumed between 15 and 25 metric tons of marijuana and spent between $125 million and $225 million on marijuana in 2014. There are nearly 40 times as many regular marijuana users living within 200 miles of Vermont borders as there are living inside Vermont. Under a scenario in which Vermont legalized marijuana, taxed aggressively, suppressed its black market, and consumption increased by 25 to 100 percent, tax revenues from sales to Vermont residents could be in the range of $20 million to $75 million annually. 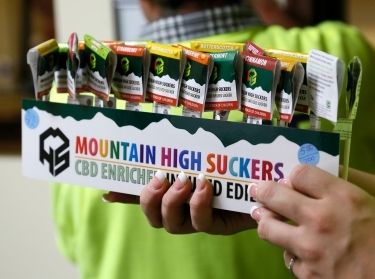 Vermont also could end up supplying large numbers of out-of-state users, directly via marijuana tourism or indirectly — unless and until other states in the Northeast also legalized marijuana. That flow could then reverse if those states imposed lower taxes, undermining revenues from taxing Vermont's own residents. The likelihood of cross-border commerce could engender a federal government response, making all revenue projections highly uncertain. State and local governments in Vermont likely spend less than $1 million annually prohibiting marijuana for those ages 21 and older. Regulatory costs associated with legalizing production and retail sales would likely exceed that level. 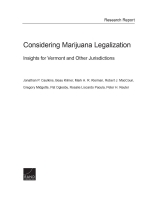 Caulkins, Jonathan P., Beau Kilmer, Mark A. R. Kleiman, Robert J. MacCoun, Greg Midgette, Pat Oglesby, Rosalie Liccardo Pacula, and Peter H. Reuter, Considering Marijuana Legalization: Insights for Vermont and Other Jurisdictions. Santa Monica, CA: RAND Corporation, 2015. https://www.rand.org/pubs/research_reports/RR864.html.